Does something like this really need words? It’s full of butter and cream and it’s fried, I mean come on?! Two things to keep in mind here: the bread pudding should be refrigerated before frying in butter and make sure that you slice it thick. Fry in butter until crusty and golden and serve with some maple syrup! 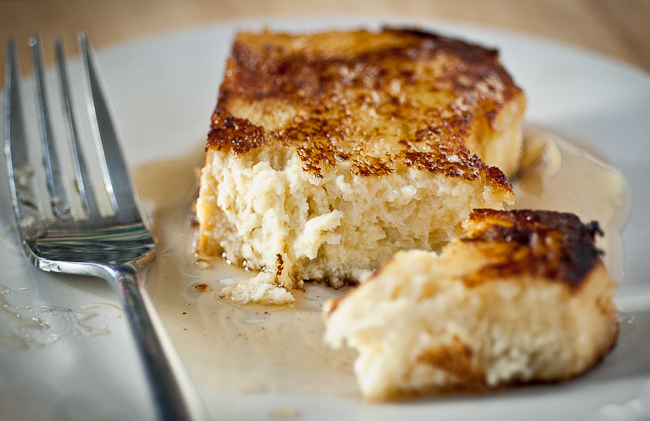 Tartine’s infamous bread pudding recipe is used to make this fried bread pudding. This recipe takes some time (especially if you make the brioche from scratch) but is well worth the effort. The slices of toasted brioche are submerged in a delicious custard of cream and eggs that slowly get soaked up by the bread. Toasting the bread is really essential here—the drier the bread is the more custard is absorbed by the bread. Once the custard is out of the oven you can eat it as the recipe directs, but once cooled I like to put in the refrigerator and use it the next day to make french toast. Cooled in the fridge the pudding slices up beautifully and fried with a little butter it turns into a delectable treat! Preheat the oven to 350ºF. Butter a 9×5-inch glass loaf dish. Arrange the brioche slices on a baking sheet. Place in the oven until lightly toasted, 4 to 10 minutes. Remove from the oven and set aside to cool. Crack the eggs into a mixing bowl and whisk until blended. Add the sugar and whisk until smooth. Add the milk, vanilla and salt and whisk until fully incorporated. Pour the custard through a fine-mesh sieve. Place the toasted bread slices in the prepared loaf pan, cutting the slices to fit as needed. Pour the custard evenly over the bread, filling the dish to the top. You may not be able to add all of the custard at this point. Let the mixture sit for 10 minutes, so that the bread can absorb the custard. Just before baking, top off the dish with more of the custard if the previous addition has been completely absorbed. Cover the dish with aluminum foil, place in the oven, and bake the pudding for about 1 hour. To test for doneness, uncover the dish, slip a knife into the center, and push the bread aside. If the custard is still very liquid, re-cover the dish and return the pudding to the oven for another 10 minutes. If only a little liquid remains, the pudding is ready to come out of the oven. The custard will continue to cook after it is removed from the oven and it will set up as it cools. Let the pudding cool overnight. Slice the pudding into thick slices and fry in some butter. 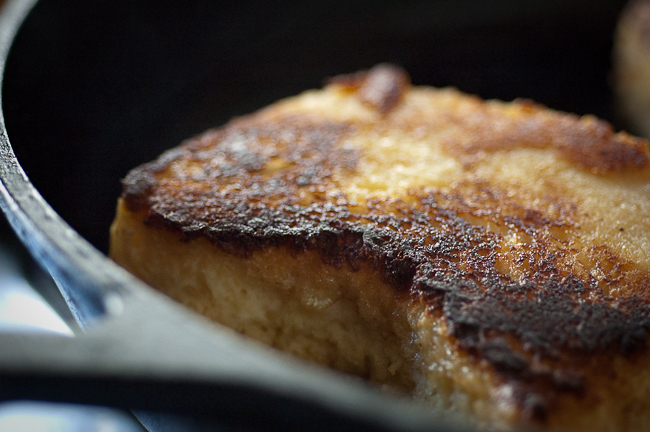 To see some in progress photos of me making the brioche bread pudding click here. You had me at bread and pudding. Nice photos. Really mouth watering! Wowww….that is so naughty. And delicious. I just ate and now I'm hungry. These pictures are incredible, I feel like I'm at the table about to devour this dish. 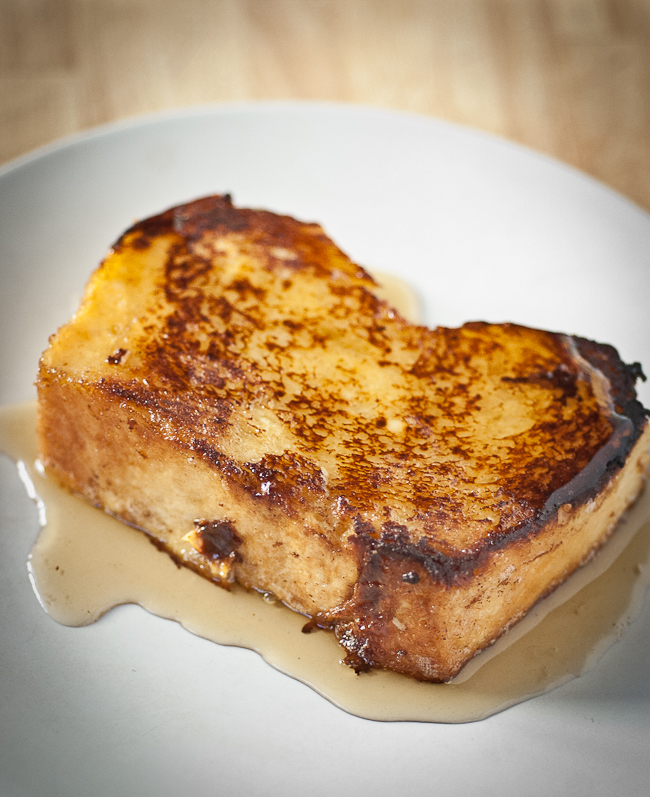 I want French toast!